The traditional black and white prints are called “gelatin silver” because the photosensitive emulsion that is on the paper is made up from minute silver crystals called “silver halides” (normally a blend of silver bromide and silver chloride). Today we use the definition “gelatin silver print” also to distinguish it from the digital print and from the old albumin and platinum prints. There are two types of photographic papers: the fibre-based papers and the resin-coated papers. The best are the fibre-based papers, the only ones that should be used to make Fine Art prints. The basis of this paper is obtained from rags of cotton or linen, or from pine, chestnut, or poplar woods. This paper is called “fibre-based” or “baryta” because between the paper and the emulsion there is a thin layer of barium sulphate (barite) that, being total white, is the element determining the whites of the prints. The pureness of the white in fact is essential to produce even the slightest tones of greys. The silver emulsion is fixed to the paper with a special glue made of an animal gelatine mixed with synthetic binding agents. I use fibre-based papers like Ilford Galerie, Ilford Multigrade, Bergger and Rollei Vintage. From each of them I obtain a wide range of results in terms of both quality of the printing and final colour. In the resin-coated papers the silver emulsion is laid on a polyethylene basis. Compared to the fibre-based papers, these papers offer a lower quality in terms of deepness and richness of tones. The biggest problem of traditional black and white photography is the paper. Until recently dozens of different papers of many brands were on the market, and this gave photographers an enormous choice and consequently a huge expressive potential. In fact each paper has a specific distinctiveness. Papers can be very different from one another and produce aesthetic results of incredible variety. With the advent of digital photography the market of traditional black and white photography has become smaller and smaller. 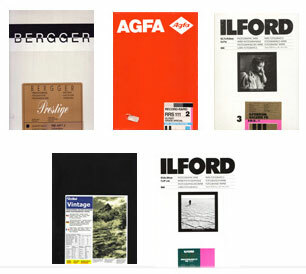 Kodak discontinued the production of gelatin silver papers and a giant company like Agfa closed down: events like these were unimaginable until some years ago. Today only few companies still produce gelatin silver papers, the choice is limited, and consequently the expressive potential is at risk. Luckily this is counterbalanced by the high quality these companies still do guarantee, especially in the field of variable contrast papers that have almost completely replaced the fixed gradation papers. These high-quality papers still enable us to make excellent prints and satisfy the demanding taste of those who keep working in the darkroom with enduring passion, dedication and perseverance.